High Road for Human Rights is unique in that it addresses climate change within a human rights framework. 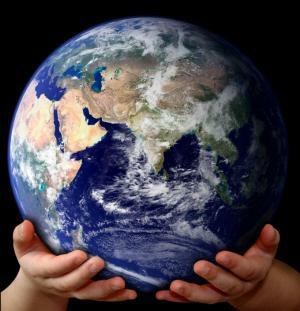 Without aggressive action, including an end to construction of coal-burning power plants, our world will be a very different, far less hospitable, planet for our children and later generations. Hundreds of millions of people will be forced from their homes; draughts, floods and more extreme weather events will kill many people; water resources will disappear; and ocean life will be severely impacted. Help us organize people and teams, community-by-community, to protect our climate and prevent catastrophic human rights violations. Sustainability – economically, environmentally, and as it relates to the public health and quality of life – is achieved only when those who propose, advocate for, make, and implement public policy keep in focus the best interests of residents and visitors – now and far into the future. The EPA, and the national science academies of every country that have opined on the matter, have taken a stand on the certainties associated with global warming: The earth’s climate is warming and humans are the cause due to our burning of fossil fuels. Greenhouse gas emissions are also responsible for the alarming phenomenon of ocean acidification. Carbon dioxide in the atmosphere and in water are in equilibrium with one another. Therefore, as atmospheric levels increase, so do the levels of CO2 dissolved in the ocean waters, especially in shallow waters where most ocean life flourishes. Dissolved CO2 reacts with seawater to form carbonic acid, which increases the water’s acidity. 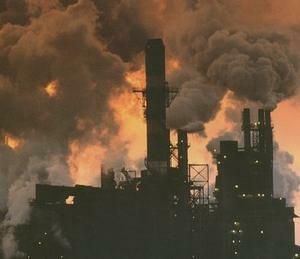 According to a 2005 report of the Royal Society of London, in the past 200 years the oceans have absorbed approximately half of the CO2 produced by fossil fuel burning and cement production. Calculations based on measurements of the surface oceans and our knowledge of ocean chemistry indicate that this uptake of CO2 has led to a reduction of the pH of surface seawater of 0.1 units, equivalent to a 30% increase in acidity. This constitutes an enormous threat to much of the life in our planet’s oceans. 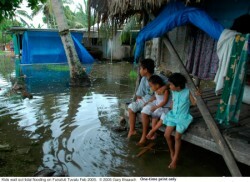 In particular, the Pacific Island of Tuvalu is disappearing under rising ocean waters (see: above image). The prime minister of New Zealand had to give haven to islanders from Tuvalu as floods have made the island uninhabitable. Global warming results in killer heat waves. In 2003, the August European heat wave broke all records for heat-related deaths. There were 35,000 deaths, with the death toll in France alone nearly 15,000. A group of British scientists has concluded that the risk of major heat waves has doubled due to climate change. In the US, heat-related deaths exceed those from all other weather-related deaths combined. Coastal regions, with about half the world’s population, are at enormous risk of massive flooding, as glaciers and ice shelves are melting at rapidly accelerating rates. For instance, the Arctic Ward Hunt Ice Shelf, 150 feet thick in 1980, thinned to less than half that depth by 2003 (see: below image). 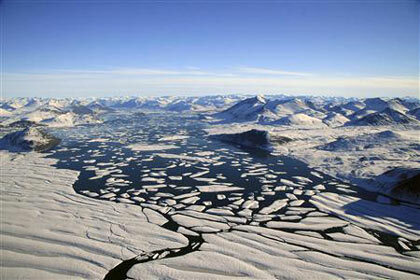 The Kyoto Protocol is not enough to protect us from devastating climate change. High Road for Human Rights will work toward the global community can joining together as it did through the Montreal Protocol, which put in place the policies and practices that significantly limited the release of chlorofluorocarbons (CFCs) into the atmosphere and ultimately solved the problem of ozone depletion. We must unite and act quickly to achieve these same results as it pertains to climate change. Ultimately, the responsibility for mitigating the disastrous impacts of climate change on human rights rests on each of us. Let us do all we can to assure that the failure to protect the atmosphere, as well as protecting the human rights effected by global climate change, is never again condoned because of a perception of public apathy in the United States – and to do all we can, consistent with our moral values, to express our concern, compassion, and insistence on constructive action in the clearest, most powerful possible terms. Together, through High Road for Human Rights, we can change the wind. We can increase awareness about preventable suffering and work together, through focused organizing, to effectively push for change that will bring about a safer, kinder, more just world. No matter what else we do, if we continue burning coal at current rates, the oceans will rise, coastal areas will be inundated, hundreds of millions of people will be killed or displaced from their homes, droughts will occur in some areas, massive floods will devastate other areas, and drinking water resources will be destroyed. The earth will be a very different, inhospitable place and its inhabitants will be at tremendous risk of starvation, loss of water resources, disease, wars over diminishing resources, the death of forests, and destruction of communities, and extinction. There has been a decrease in the percentage of Americans that accept the reality of global warming.In 2008, 71% of Americans thought there was sufficient evidence that global warming is happening. In 2009 this dropped to 57%. Furthermore, 44% of Americans believed global warming was a threat in 2008, but this dropped to 35% in 2009. Additionally, in 2008, 47% of Americans believed that global warming was anthropogenic, but in 2009 this decreased to 36%. Policies on climate change are also unknown by the general public. For example 55% of people do not know what “cap and trade” is and the impact it has. Public skepticism of global warming is on the rise. More people believe that the media exaggerates global warming. In 2009, 57% of Americans believed that the media correctly portrays global warming or underestimates it. This is a decrease from 2006 in which 66 % believed that the media correctly portrays global warming or underestimates it. In 2009, 41% of Americans believed the media exaggerated global warming, while in 2008 only 30% believed the media exaggerated global warming. Media coverage of global warming directly influences public perception and policies. Since media coverage of global warming expresses skepticism of scientific consensus and anthropogenic global warming, it results in the public also being skeptical. 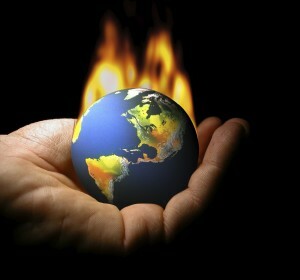 Global warming is also portrayed in a “balanced” way, in which skeptics of global warming are give a prominent voice. Boykoff and Rajan report that “Even when there is sufficient consensus over data and models, skepticism is induced either by manufacturing opposing facts or conflating facts with value.” Presenting opinions rather than scientific facts is another weakness that must be improved upon. There have been improvements in media coverage of climate change, but the media still covers climate change in a “balanced” way and ignores scientific consensus. The media also fails to connect climate change to people’s lives. There are two main techniques used in climate coverage, and both techniques dampen public interest and activism: one style of coverage is alarmist, emphasizing catastrophes and disaster, while the other over-emphasizes small-actions such as recycling, “going green” etc. There should be an emphasis on policies that reduce CO2 emissions, and the ways in which climate change is relevant to people’s lives. Coverage of climate change in the media is impacted by “journalistic norms.” Journalistic norms include: personalization, dramatization and novelty, authority-order and balance. Selling a story and generating public attention are the main objectives in journalism. Climate change sells when there is controversy. This has resulted in partiality in climate change coverage. Concern about and belief in global warming has decreased. In 2008, 18% of adults in the United States reported that they were alarmed about global warming (being the highest level of belief/acceptance of global warming). Another 33% were concerned (second highest level of belief/acceptance of global warming) and believed it was happening. In 2009, there was a sharp decrease: only 10% were alarmed, and additional 29% were concerned. The percentage of adults in the United States that rejected climate change in 2008 was 7%; another 11% reported that they were doubtful; 12% felt disengaged from global warming. In 2009 this increased:16% rejected climate change, 13% were doubtful and 6% felt disengaged. Television and daily newspapers are top providers of scientific information. The internet is also playing an increasing role in climate coverage. In the 1990’s there was an increasing presence of “skeptical” scientists represented in climate change coverage in the media. Furthermore, journalism tends to indiscriminately diffuse information, rather than providing accurate information. Media coverage is also affected by the framing and presentation of the story being covered. Economics, political pressure and culture also contribute to the framing and presentation of a piece. There are three main factors affecting the media’s coverage of climate change: lack of understanding of climate change facts, the difficulty of overcoming the need to “sell” a story, and the lack of financial resources in covering climate change.